Halloween is right around the corner, which means that it's time to start thinking about costumes. And if you're like me, you probably like to subject your pets to ridiculous costumes too. And a sushi roll certainly fits that description. But it's seriously the cutest thing ever. Click through to check out my puggle modeling his new costume, and find out how to make your own version! So your fur baby has been bugging you incessantly to go outside, but it's still freezing cold out. I hear ya. Well, why not treat him or her to a fun new toy? Or bed? Or bow tie? Today we have five quick and easy DIYs that Fido is sure to love. Click through to check 'em out . Halloween is just around the corner, and I realized that I didn't have a costume lined up for my puggle Charlie. Turns out there are tons of great tutorials floating around the internet! 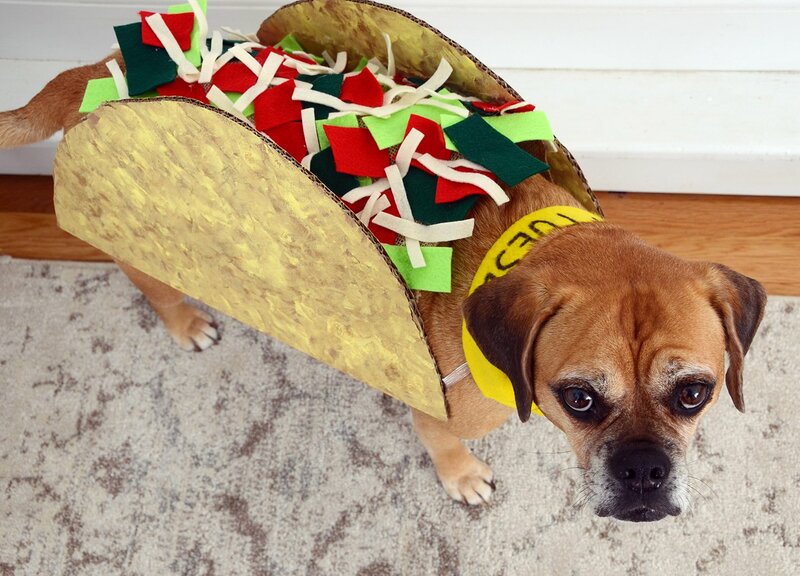 Here are ten totally adorable last minute DIY pet costumes. 12 Fun and Easy DIY Pet Accessories: Toys, Leashes, Collars -- and More! It's raining cats and dogs! Or, cat and dog accessories anyhow. Check out these easy DIY pet projects -- most can be made in a single afternoon -- and let us know which one your furry friend would fancy! Want to dedicate some wall space to your dog or cat? Not too keen on cheesy pet portraits? Well, I have just the answer for you - make a custom print using some non-toxic paint and your pet's paw! Car rides with your pooch can be fun, but if your furry friend is leaving behind more hair than you can handle, it might be time to get a car seat cover! Instead of spending loads of money, though, why not give this DIY version a try? Besides DIYing, DIYers love their pets. These 15 examples prove as much. From magical to minimal, from challenging to easy, there's something for every decor and skill level. My pup Charlie goes through toys quickly. And I mean really quickly. What can I say? The dog loves to play. So I've found that the best option is to make toys and games for him. Here are a few of my favorites, along with some great toys for your feline friends as well. Curbly Shopping Guide: 20 Cool Products for Pets! June is kids and pets month here at Curbly which, as a self-proclaimed "Crazy Dog Lady" makes me really happy! While I love all animals and pets, today I'm focusing on the furry kind: cats and dogs. Check out my top ten picks for each and give your four-legged friends something to really bark (or purr) about! When I adopted my puggle, Charlie, two years ago, one of the biggest surprises was how much stuff I needed to get for him...and how expensive everything was. So of course, the logical solution was to start making things... and you can too! Here are ten of my favorite projects. Being a dog bed maker myself, I'm tickled to see Lisa's project on Design Sponge. This style of heavy, cumbersome cabinetry is plentiful in the secondhand market and you better believe I scurry past it like it has The Plague. Lisa, on the otherhand, had vision. May I get a collective 'awwww' please?? Monica turned a Mac monitor into a cute little bed for her pup Zelda.